Dig Dug is a 1982 arcade game released by Namco and distributed by Atari outside of Japan. The goal in Dig Dug is to score as many points as possible by digging and ‘killing’ the two types of antagonists…Pookas and Fygars. There are two ways to ‘kill’ Pookas and Fygars…by dropping rocks on them or by inflating them until they ‘pop’. The farther down that you dig and ‘kill’ your enemies, the more points you will score. Additionally, double points are awarded, if Fygars are pop’d horizontally. Finally, if a player drops two rocks in a round, bonus items, such as fruits, will appear on the screen and additional points are awarded for ‘eating’ these items. Dig Dug was designed to run on Namco’s Galaga arcade board (3x Z80 CPU’s) and was extremely popular. Many people consider Dig Dug one of the best arcade games of the era. The game, with it’s simple concept and graphics was a natural to port to home systems. It was ported to the Atari 2600, 5200, 7800, Intellivision, and just about every other 8-bit home console/computer. The one exception was the Colecovision…a Dig Dug port was developed by Atarisoft, but never officially released. 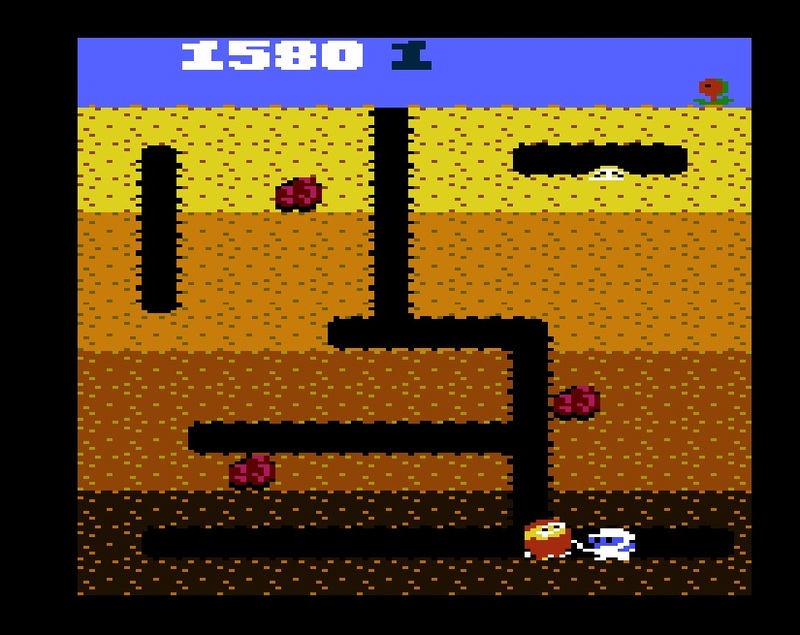 The Atari 2600 version of Dig Dug was released in 1983 and, although the graphics were simplified, the game play is intact and solid. Dig Dug, Pooka, and Fygars have simplified mono-color sprites and the background graphics and rocks are not pretty to look at, but the 2600 version is fun to play and it has a cool start screen! With the capabilities of the Melody board and the talent of some of today’s homebrew programmers, I wonder how long it will be before someone makes an enhanced Dig Dug for the 2600? The 5200 version of Dig Dug was also released in 1983 and features improved graphics and sound over it’s 2600 counterpart. Dig Dug, Pooka, and Fygar are still rendered in mono-color graphics, but the background and rocks are much closer to the arcade version. Control with the standard 5200 analog joystick is solid and the game play is very close to the arcade. Although it should have been possible to have multi-color sprites which would have improved the appearance of the game, Dig Dug for the 5200 is solid and a great addition to every 5200 collection! Dig Dug for the 7800 was one of the release titles for the system and is the ‘premier’ version for 8-bit Atari consoles. The sprites for all of the characters are rendered in multi-color, there is a cool start screen, and the sound (usually a short coming for the 7800) is well done. The NES version may have slightly sharper graphics, but the 7800 version is that hands down winner for Atari console versions. All of the arcade elements and scoring are present and it is a blast to play. If you have a 7800, this game is a must have for your collection! Back in the eighties, I played Dig Dug a few times, but had never really learned much about the game. In doing the research for this post, I have learned how the scoring works, the strategy for playing Dig Dug, and why so many people have such fond memories of this great game. 100’s of Thousands (if not millions) of Dig Dug cartridges were made for all three Atari 8-bit consoles, so they are easy to find and inexpensive. No matter which Atari console you have, Dig Dug belongs in your collection! Categories: 2600, 5200, 7800, Atari, Game Reviews | Tags: Atari VCS 2600 5200 7800 | Permalink. I really enjoy owning my classic game consoles and collecting games. I enjoy the simplicity of putting a cartridge in a console and only having to master the control of a joystick with one or two buttons. Why, then, consider emulating these classic systems? First of all, emulation has made the Atari Flashback series possible. The first Flashback was based on a ‘NES on a chip’ and all 20 games ran in emulation. In the latest Flashback 4, the emulation has improved to the point where it is so good that the games play almost as they do on an original 2600. Emulation has helped make it cost effective to provide 75 games (with wireless controllers) for as little as $30-40. I was one of the lucky people to be able to get an HP TouchPad when HP sold them at fire sale prices. I am among a smaller group of people that still use their webOS devices on a daily basis. 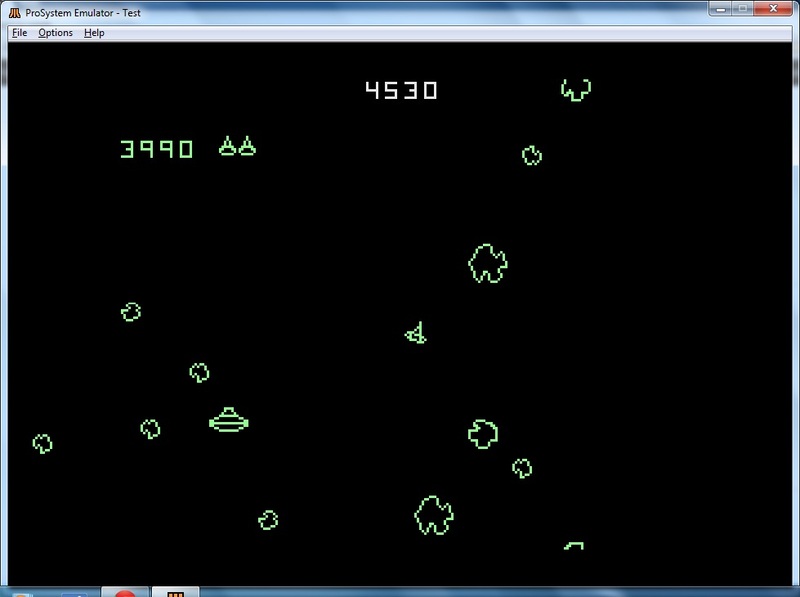 Believe it or not, there is a 2600 emulator for webOS! Emulators also exist to allow you to play classics like Asteroids or Space Invaders on your Android or IOS smart phones and tablets. This is great if you are travelling and want to bring some of your favorite games along. The main reason that I wanted to set up an emulator on one of my PC’s was to help test new homebrews for the 7800. The 7800 was one of the later systems to have an emulator developed for and there are a couple of different choices. I chose ProSystem to install on a Windows 7 laptop. Not wanting to have to use the keyboard to play games, I also picked up a USB joystick made by Curt Vendel of Syzygy. Curt has designed these joysticks to look and feel just like an original Atari CX40. I was surprised at how good the emulation is on ProSystem and how much fun it is to play Atari games on a PC, when you have a joystick. With guys like Bob, Ken, Mark, and Perry still developing and enhancing games for the 7800, I am now looking forward to being able to test and provide feedback on their latest creations. Whatever your system of choice is, there is probably an emulator that has been developed for it. If you are an Atari fan, consider setting up Stella or ProSystem on your PC and getting one of Curt’s awesome USB joysticks. You too can help improve homebrews by testing and providing feedback! Categories: 2600, 7800, Atari | Tags: Atari VCS 2600 5200 7800 | Permalink.